Picture, signature and quote of Howard Barnstone. Image available on the Internet and included in accordance with Title 17 U.S.C. Section 107. BARNSTONE, HOWARD (1923–1987). Howard Barnstone, architect, was born on March 27, 1923, in Auburn, Maine, the son of Robert C. and Dora (Lempert) Barnstone. He spent his childhood in Auburn and in New York City, then attended Amherst College (1940–42), Yale College (A.B. 1944), and Yale University (B. Arch. 1948). From 1944 to 1946 he served as a lieutenant, junior grade, in the United States Navy. He moved to Houston in 1948 and remained there for the rest of his life, teaching and practicing architecture. Barnstone's early work was strongly influenced by the New York architect Philip Johnson and the Chicago architect Ludwig Mies van der Rohe, both of whom executed modernist buildings in Houston in the 1950s. This type of architecture was especially identified in Houston with the collectors Dominique and John de Menil, whose house had been designed by Johnson and who were patrons of Barnstone's for the duration of his career. While in partnership with Preston M. Bolton (1952–61), Barnstone produced a series of rectilinear, flat-roofed houses in the manner of Johnson and Mies that brought Bolton and Barnstone to national attention. These included the Gordon (1955), Moustier (1955), Farfel (1956), and Owsley (1961) houses in Houston, the Blum house in Beaumont (1954), and the Cook house in Friendswood (1959). Photograph, Picture of Rothko Chapel. Photo by Hickey-Robertson. Courtesy of Houston Museum District. Image available on the Internet and included in accordance with Title 17 U.S.C. Section 107. During the 1960s, however, Barnstone moved away from this precisionist approach. His public buildings–Piney Point Elementary School (1962), the Galveston County News Building in Galveston (1965), and the Center for the Retarded (1966)–exhibited differentiated massing shapes and emphatic articulation of reinforced concrete structural members. His houses, especially those produced during his partnership with Eugene Aubry (1966–69), tended to be architecturally introverted. Though self-effacing externally, they were opened internally with high ceilings, simple planar walls, and dramatic expanses of glass. The Mermel (1961), Maher (1964), Bell (1969), and Kempner (1969) houses, the Levin house in Galveston (1969), the Vassar Place Apartments (1965), and Guinan Hall at the University of St. Thomas (1971) exhibited these tendencies, as did the Rice Museum (1969, now altered) and Media Center (1970) at Rice University and the Rothko Chapel (1971). Photograph, Picture of Howard Barnstone with his wife, Gertrude, at Totems Not Taboo opening, 1959 . Image available on the Internet and included in accordance with Title 17 U.S.C. Section 107. During the 1970s and 1980s Barnstone's work became even more varied architecturally. Marti's specialty store in Nuevo Laredo, Tamaulipas, Mexico (1972), built for his stepmother, Marti Franco; the Graustark Family Townhouses, Houston (1973); a country house in Carefree, Arizona, for Mr. and Mrs. Jean Riboud (1976); alterations and additions to a group of Long Island colonial houses in East Hampton, New York (1977); the Encinal apartments, Austin (1979); the Schlumberger-Doll Research Center, Ridgefield, Connecticut (1980); the De Saligny apartments, Austin (1983, with Robert T. Jackson); and the Schlumberger Austin Systems Center, Austin (1987, with Robert T. Jackson) were his major projects of this period. 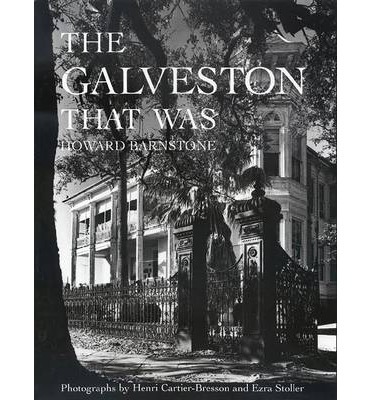 Cover of Howard Barnstone's book, The Galveston That Was . Image available on the Internet and included in accordance with Title 17 U.S.C. Section 107. Barnstone married Gertrude Levy of Houston in 1955; they were divorced in 1969. They had three children. Barnstone joined the faculty of the University of Houston in 1948. He became associate professor of architecture in 1952 and professor in 1958. He taught as a visiting instructor at Yale University (1964) and the University of St. Thomas (1965). He wrote two books on Texas architectural subjects, The Galveston That Was (1966) and The Architecture of John F. Staub, Houston and the South (1979). Barnstone became a member of the American Institute of Architects in 1951 and was elected to fellowship in the institute in 1968. He served at various times on the boards of numerous civic and cultural organizations. He was a member of Congregation Beth Israel in the 1950s and 1960s. In 1985 he was baptized and became a parishioner of Christ Church. Howard Barnstone suffered from manic-depressive psychosis and endured periods of severe depression in 1969 and in 1985–87. As a result of the latter episode, he killed himself, on April 29, 1987, in Houston. He is buried at Forest Park East Cemetery in League City. His papers are deposited at the Houston Metropolitan Research Center of the Houston Public Library. American Architects Directory, 1955, 1962. Stephen Fox, "Howard Barnstone, 1923–1987," Cite, Fall 1987. Mark Hewitt, "Neoclassicism and Modern Architecture, Houston Style," Cite, Fall 1984. Houston Post, May 2, 1987. New York Times, May 2, 1987. Texas Observer, May 29, 1987. Who's Who in America, 1972–73, 1982–83. Handbook of Texas Online, Stephen Fox, "BARNSTONE, HOWARD," accessed April 19, 2019, http://www.tshaonline.org/handbook/online/articles/fbael.